Another win with the non-vegan crowd last night! I love it when that happens. It was my daughter’s birthday so I wanted to make something special while keeping it vegan. Her favorite comfort food growing up was lasagna so I dug around a bit until I came up with this recipe for Vegan Lasagna with Tofu Ricotta. It was a hit! The ‘ricotta’ was so convincing, no one believed me when I told them it was tofu. Light and crumbly with just enough twang, my wife was eating it out of the bowl! I mean what’s not to love? Whole wheat lasagna noodles smothered in a rich marinara sauce, layered with a rich, creamy, tofu spinach ricotta ‘cheese…mmm. Garfield – eat your heart out. This does take a bit of prep work – but if you have a food processor it will go fairly quickly. Start by thawing a 10oz package of frozen spinach. Then soak 1/4 cup of cashews. They both should be ready to use by the time we’ll need them. You’re also going to need a fair amount of Marinara for this recipe. Luckily I have this recipe for homemade Marinara Sauce handy. It’s quick and simple with just s few common ingredients. Plus it has absolutely no oil and a fraction of the sodium of store-bought. So much healthier for you – and tastier too! For the noodles, I used Whole Wheat Lasagna noodles. Pretty simply – boil some water and drop them in. You’ll want about 10 of them (1 extra in case any breaks). Follow the directions on the package and then place them in a colander to drain. The Ricotta was something I had to dig around for. Some people use Tofu, some use Cashews, some even use Tahini? I experimented and combined the features I liked from several different recipes and I’m pretty happy with the results. The fam sure loved it anyway! Drain a 16oz package of Extra Firm Tofu and then lay the whole block on some paper towels. Cover the tofu with some more paper towels and then place a plate or something flat on top. A cutting board would also work. Then lay a big cookbook, or something heavy on top of that. I used a cast iron skillet. We want to get as much water out of that block of Tofu as possible. Meanwhile, drain the cashews and add them to your food processor. Toss in the garlic and give it a spin. When you almost have a cashew powder – add your tofu. I broke it up into smaller pieces to add it to the processor. Pulse this mixture until it resembles ricotta cheese. Finish making the cheese by adding the rest of the ingredients and pulse until well mixed. 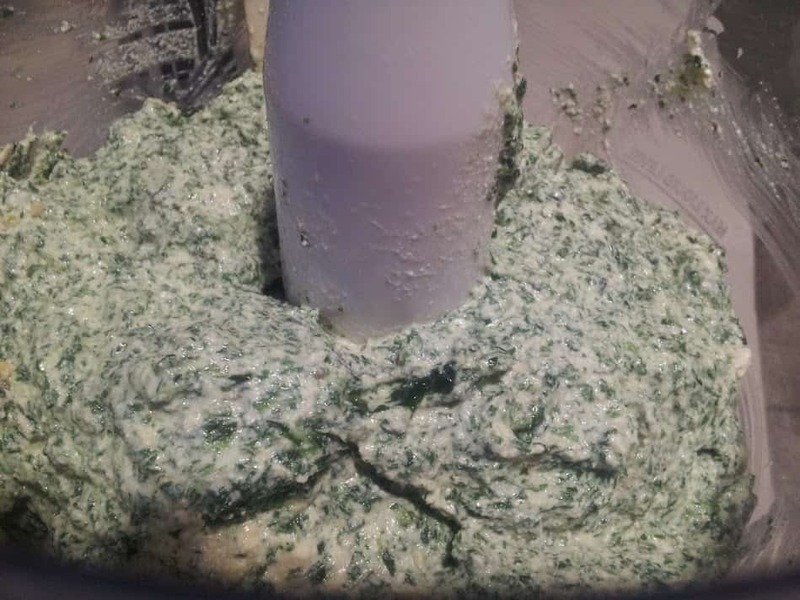 When your ‘cheese’ is ready, rinse and drain your spinach and add it to the mixture. It should be thawed enough by now. Don’t worry if there’s still a few frozen pieces, it will break up. Adjust the salt and pepper to your liking and your “ricotta cheese” is now ready to spread. Preheat your oven to 325 and get your lasagna pan out. It’s party time! 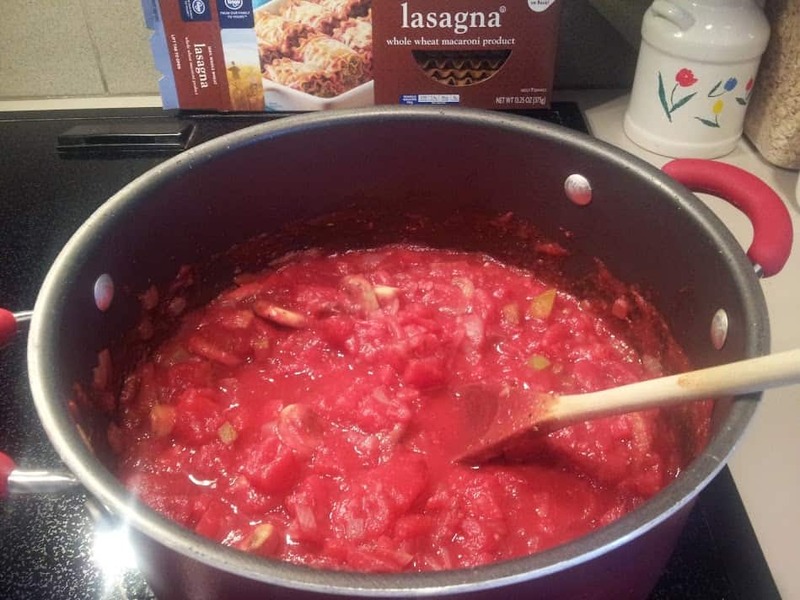 Layer the bottom of your lasagna pan with sauce – just enough to completely cover the bottom. Then lay 3 noodles side by side. Cover with some more sauce and then spread some ricotta on top of that. Layer 3 more noodles and start over. Noodle, sauce, cheese, noodle, sauce, cheese. The last 3 noodles go on top smothered by the rest of the marinara. Bake at 325 degrees for about 30 minutes. Sprinkle on some Vegan Parmesan and enjoy! As always, thank you for all the kind comments, and keep them coming! Whole wheat lasagna noodles smothered in a rich marinara sauce, layered with a rich, creamy, tofu spinach ricotta 'cheese…the perfect vegan lasagna! Although I haven’t posted there myself, I’ve been reading your posts on McDougall boards for some time and recently checked out your fantastic blog. My partner and I made the lasagna this evening. We followed the recipe faithfully, although we added black olives in one of the layers and extra garlic in the tofu ricotta. 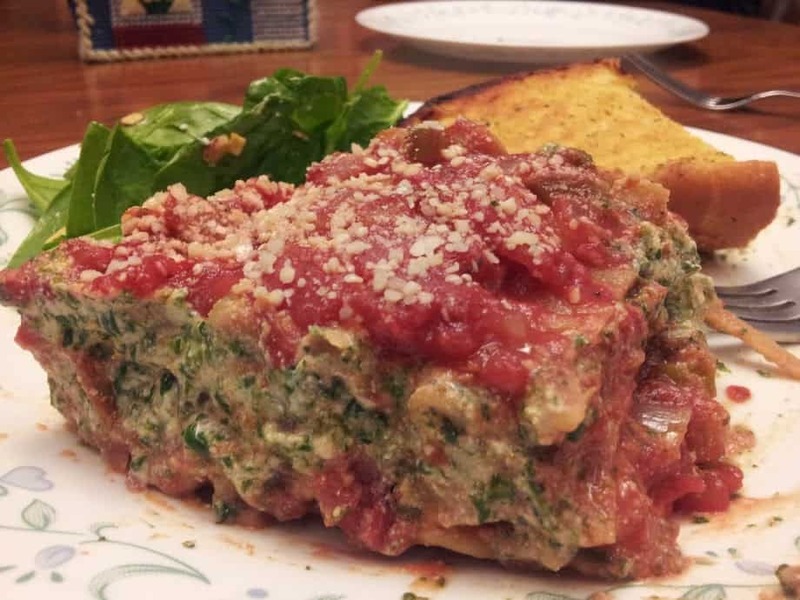 We were blown away – the best lasagna we’ve ever made. Thanks for the amazing recipe, and keep up the good work. Ooooh the black olives sound like an awesome idea! And extra garlic can never go wrong. We use a LOT of garlic around our house too. Thanks for the kind comment and I’m so glad you liked the recipe! what is the yeast for? Is it a binder for the tofu? Nutritional Yeast is what gives it the cheesy flavor, without the dairy of course. Made this lasagna tonight for dinner and it was a huge hit! I had two pieces……and didn’t feel guilty!! It was fantastic and I was pleasantly surprised since I have not had success with tofu. Thank you so much for sharing!! Will be trying out the mac’n cheese tomorrow! I never thought I’d be a fan of Tofu either, but it surprisingly comes in handy. Tonight I made a Mushroom Stroganoff using tofu as the base for my sour cream sauce – came out pretty darn good. Recipe coming soon! 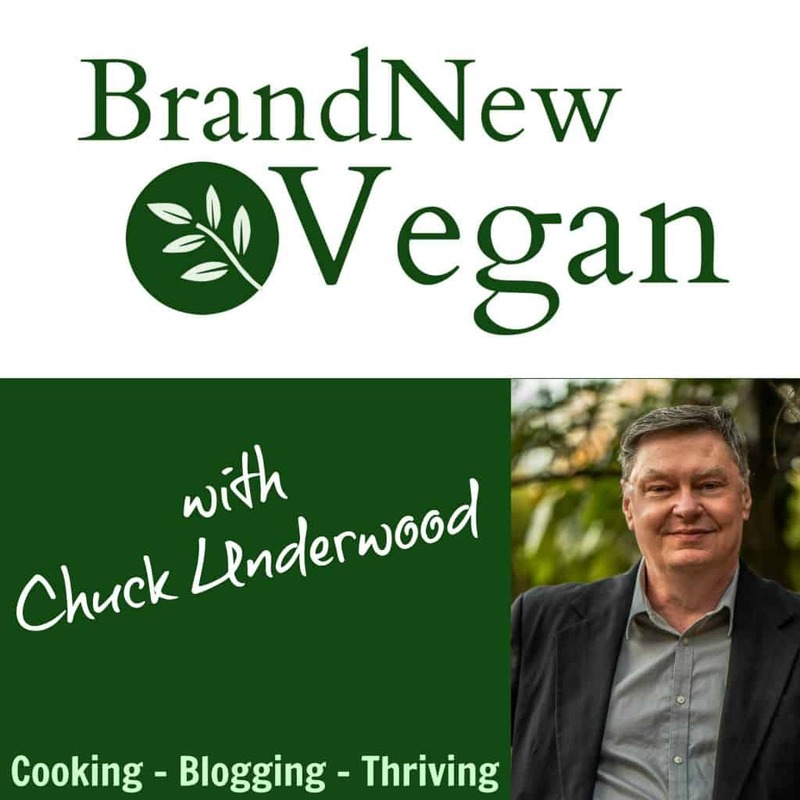 Chuck, have you ever thought about making a lasagna with the cauliflower and mushroom ground “meat”? Do I have to cook the noodles first…or can they be used dry? Adding more veggies and making an extra batch to actually last the week! 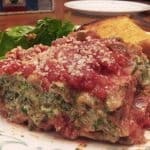 If you’re looking for a dang good vegan lasagna recipe and want to impress your non vegan/vegetarian friends, this is it! Can this be made ahead and baked the next day? I made this today, adding a layer of breaded baked eggplant under the last layer of noodles. Delicious!! If you soak them cold – the longer the better. Up to overnight – but at least an hour or so. If you use boiling hot water though, you can get away with as little as 15 minutes. I used gluten free pasta and the only type available at my store is the type that says no need to precook. I noticed another poster had a question about this. I’m happy to report that with increased cooking time to 50 minutes, the no cook pasta worked well in this recipe. 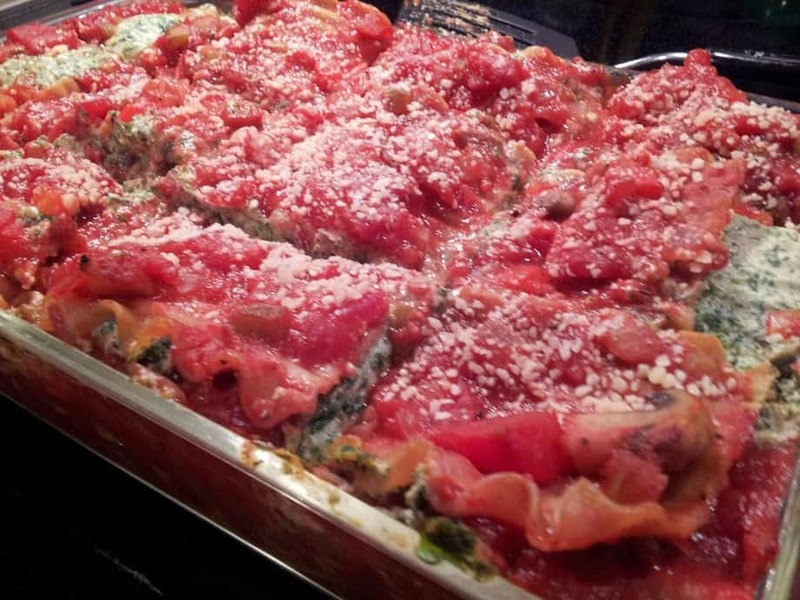 Chuck – this is the best lasagna I’ve had in a long time. I ate it for dinner last night and for breakfast this morning. Yum!